This online service creates shortcuts to web pages with embedded icons. The shortcuts do not have an arrow in the corner, because they are tiny executables. If you are an internet user, you can create custom shortcuts for your favorite websites and place them directly on desktop. If you want to use custom icon instead of one of the stock icons, you need to have this icon on your computer and its size must be less than 50 kB. Choose a stock icon or click the "Browse..." button and navigate to your own icon. Type the address of the web page for which you want to make the shortcut into the "Address" box. Click the "Save shortcut" button and place the file on your desktop or another suitable location. This service produces a tiny Windows exe file containing the specified icon and the address of a web page. When the application is run, it opens the web page in the default web browser. Running executable files downloaded from internet may be dangerous and shortcuts created by this service are executable files. We guarantee that the shortcut files do exactly what is described on this page and nothing else, but we recommend you to check them with your antivirus anyway. If you are a webmaster, you may prepare shortcuts with icons for your visitors and let them download the shortcuts from your web pages. If you like this service, please consider linking to this page and recommending it to your friends. Visit our library of free icons. Visit sites in our directory of clipart. 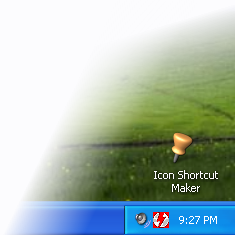 Create your own icons in our professional icon maker. Contact us and we will create an icon for you. I created my exe but Chrome tells me it's unsafe and that I should discard. Any way around this? After saving the file you need to right click the file and go into properties. Then check the Unblock. This will allow the exe to run. If chrome tells you it is unsafe, that is because of .exe and you can keep. If you get "protected" by smartscreen, then click more and then run anyway. It should remember your choice. im surprised that this website is completely free and its over 12 years old and it still works!